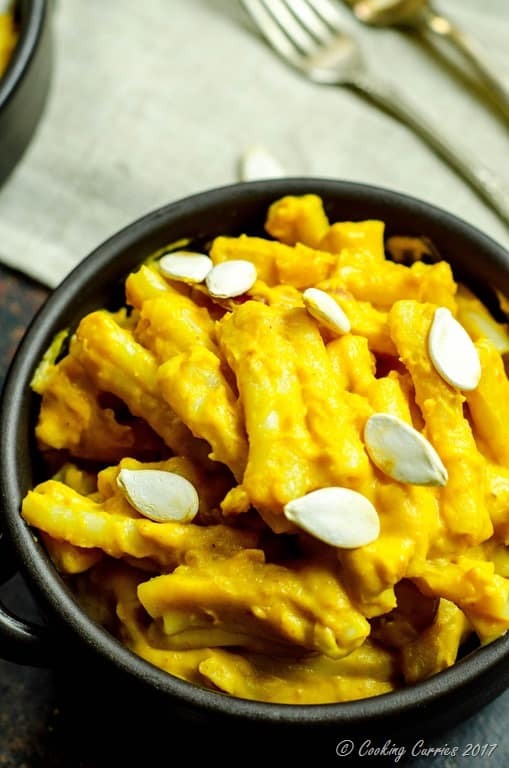 A quick and easy Pumpkin Alfredo Pasta that you can make in a jiffy for a fall weeknight dinner. It is also a great vegetarian addition to your Thanksgiving dinner table. 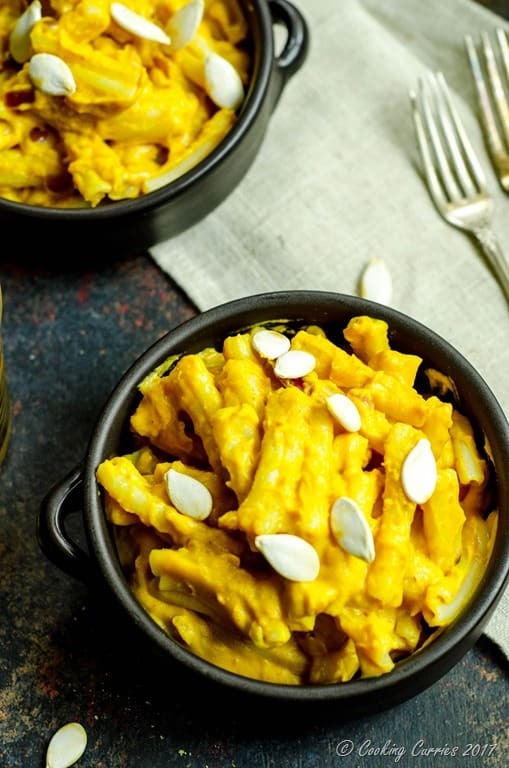 Pumpkin puree is such a handy thing to have in the pantry any time of the year, especially fall, when all you want is to curl up in everything pumpkin. Or not. 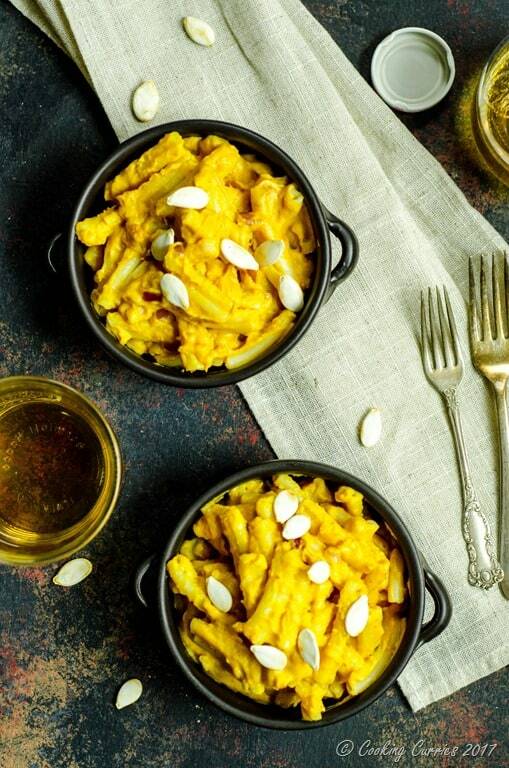 Pumpkin has so many nutrients in it, like any other vegetable, and is especially rich in its fiber content. Also it makes your pasta sauce so much creamier. Need I even talk about the gorgeous color!? 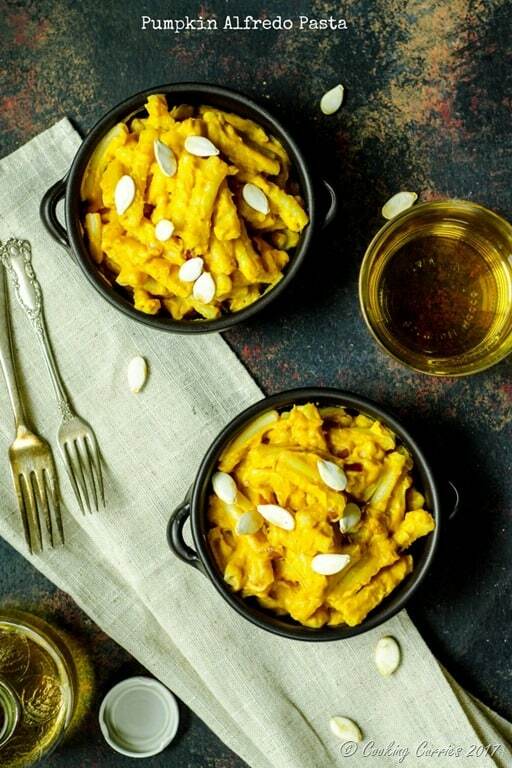 Whether you LOVE pumpkin or not, this is a great pasta recipe, as the pumpkin flavor is so subtle. There is just a little hint of sweetness in there and some more body to the sauce. The garlic and shallots in it gives out a lot of flavor that just makes you wanna finish the whole bowl really quickly. There is no spices added to this, as I wanted to keep the sweet pumpkin flavor and personally, I am not a big fan of pumpkin spice. But, feel free to add that to make it more festive! This is a great weeknight dinner in itself or can be a great vegetarian addition to your Thanksgiving table. If you are looking for more vegetarian mains for your Thanksgiving table, here are some of our favorites : Butternut Squash Lasagna, Fettuccine with Butternut Squash Alfredo or Spicy Pumpkin Linguine. Here are step by step images for How to Make Pumpkin Alfredo Sauce. You just need to add your favorite pasta to this and your Pumpkin Alfredo Pasta is ready! Sauce is ready, to add your favorite pasta in! Cook the pasta to al dente according to instructions on the box. Drain and keep aside. Meanwhile, heat the butter and oil in a skillet. Add the garlic to it. Once the garlic starts to turn golden, add the shallots and saute for a couple of minutes. Now add the all purpose flour and whisk it in well to the fat mixture. Saute for a couple of minutes. Add the pumpkin puree and cook till it all comes together. Now add the cream to this and mix well. Let is bubble and cook for a couple of minutes. If it seems too thick, add a little water or milk to thin the sauce out. Now add the cooked pasta to this and mix well. Serve hot. Love this recipe? PIN IT to your favorite Fall Recipes, Thanksgiving Recipes or Pasta boards to save for later! My kids love our pasta, spaghetti especially. I’m adding this to the weekend menu. Thanks for the recipe. Aww!! Thank you! It’s not easy pleasing kids and I’m glad this did it ?